"The Material Life of James Castle"
The crumbling 1956 concrete bridge over the Boise River on Broadway Ave. was long overdue for replacement in 2014 when the Idaho Dept. of Transportation began an extensive community engagement campaign targeting the public and nearby businesses and institutions for input. 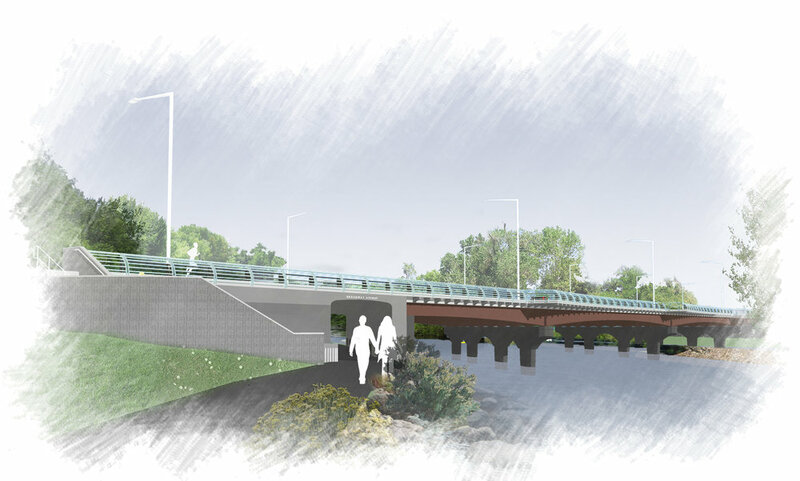 The bridge is an important thread in the urban fabric - providing critical connections for surrounding parks, university, businesses, greenbelt, as well as daily vehicle and bicycle commuters. During planning, Byron worked closely with bridge engineers on the overall form, ultimately devising a scalloped plan formed by cantilevered outlook points that provide unique pedestrian views of the river. The sweeping form of these modern belvederes are echoed by the arches girders below. Custom crash railings, pedestrian guardrails, and lighting reinforce the wave-like form of the bridge - providing a design that is both classical in it’s repetitive arch structure, and modern in it’s form and finishes. Today, the bridge serves a wide variety of commuters, cyclists, students, and stadium crowds alike. 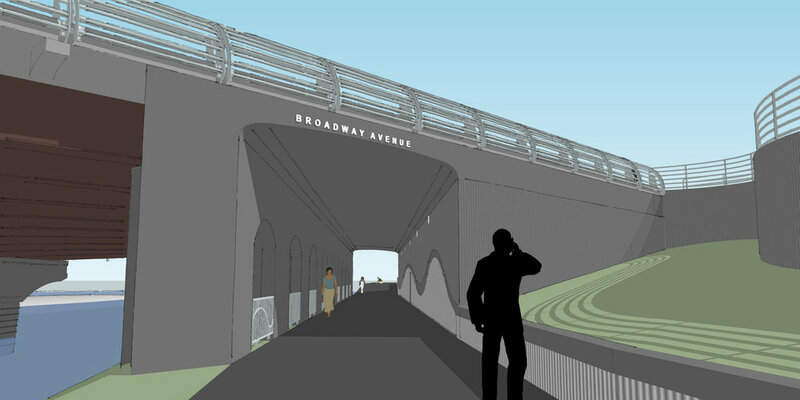 The new Broadway Bridge provides Boiseans, in a variety of age groups and abilities, a safe and pleasant experience crossing the Boise River. Need more information about our professional services for bridges and civic architecture? — Karen Gallagher, Associate Transportation Planner, City of Boise Comprehensive Planning. 2018. "Byron's background and experience was a tremendous asset to the design team. 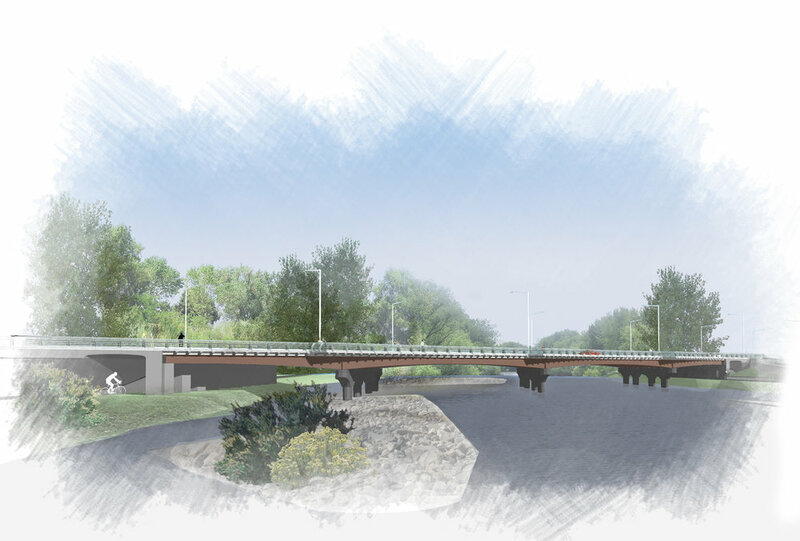 Byron listened and understood the base requirements that were needed to meet the design standards for urban highway bridges... (and) provided a signature piece of art while incorporating basic highway design standards." — Mark Campbell, Project Manager, Idaho Transportation Department. 2018. Book a one or two hour consult now.